Using only the finest and most genuine of leather, the Rogue full grain leather hats retain all the natural markings and texture of the original hide with minimal treatment in manufacture. The Rogue Explorer uses 2mm original full grain leather which is dyed and colour treated with a blend of oils and waxes to give a supple yet durable hat. 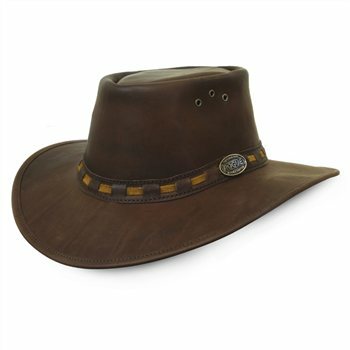 One of the key features of these leather hats is that they become softer and more attractive with age and normal wear. Rogue simply make the best hats. Period. My only complaint is that it seems that there is a difference of 1-2 cm in size between different hat types. This Oxblood leather 127X seems to be more towards the smaller size of the spectrum, whereas Black Nubuck 127B and Inyati Buffalo Leather 508B is slightly larger in the same numerical size. This might be quite in order related to the type of leather, but anyway I find it a bit tricky to choose because I am right between two sizes. Fits perfectly, looks great. I'm not used to wearing a hat and thought it might feel heavy, but I walked 25 miles in it out-of-the-box, and it was really comfortable. Bought as replacement for my Dad's birthday as his previous one has finally worn out - perfect replacement! Fast delivery too!